What a magnificent manufactured home! The soaring cathedral ceilings throughout the large home enhance its spaciousness. The Bryant is a gorgeous mobile home that offers five large bedrooms and three full bathrooms, making it ideal for a big family. 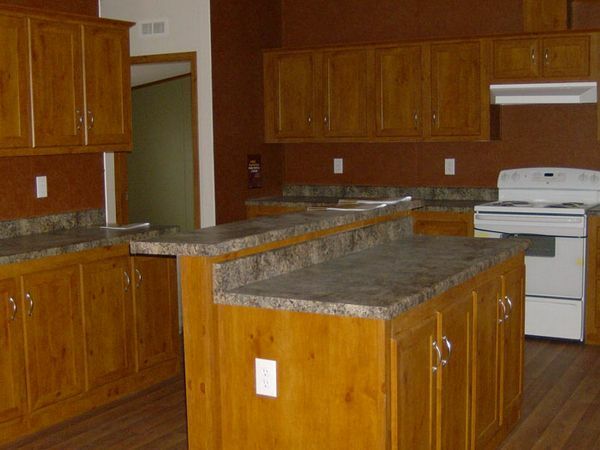 You will love the attention to detail in this manufactured home. From the lovely drapes in the living room to the luxurious garden tub in the master bath, this home offers a host of attractive standard features. You will delight at the roominess of this gracious home. Not only is there a formal living room, but there is also a comfortable den off the spacious kitchen and dining area. Add the optional fireplace in the den, and enjoy chilly evenings relaxing by the fire. The contemporary kitchen hosts a center island with snack bar, rolled edge countertops and abundant storage. You will be proud to be the owner of this great mobile home!